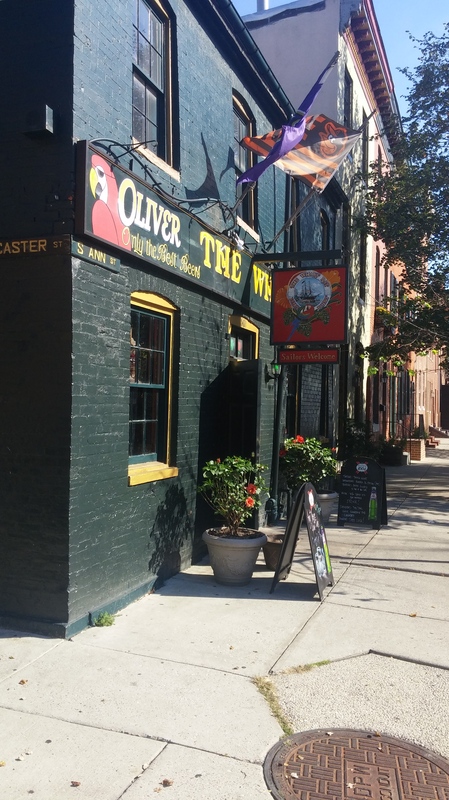 The Fells Point Fun Festival was supposed to take place this weekend. The universe has decided to make other plans. Weather has become a factor. In lieu of this, the event will likely be taking place the weekend of October 23rd-25th. 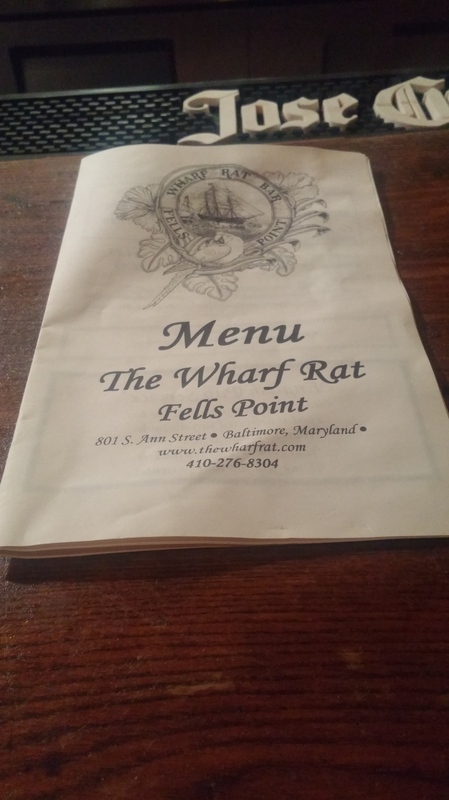 I said I would continue to write about Fells Point establishments and their pizza up until the festival. I will continue to do just that. 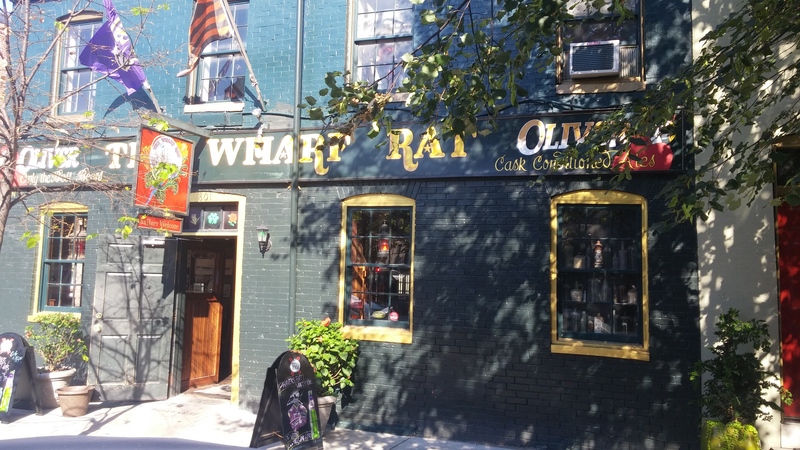 My recap of The Wharf Rat was meant to be posted on the opening day of the event. I feel this bar, more than most, symbolizes what a great neighborhood bar is all about. After thinking about it, and with all their fun pizza still fresh in my mind, I thought what the heck. I shouldn’t let weather dampen my spirits or schedule. Pun not intended. 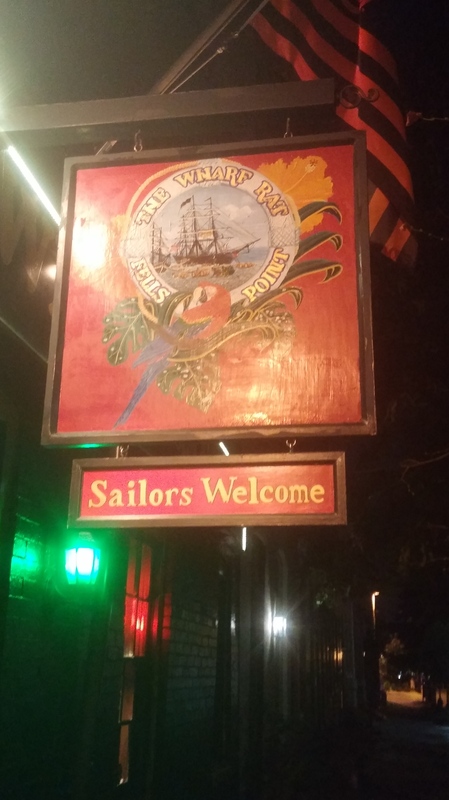 I’ve been hanging out here for many years and it’s always had a welcoming atmosphere. I’ve been to many events and fundraisers that benefited the community, local charities, and the city of Baltimore. It wasn’t until a few years ago that I even knew they had pizza. I think I’d just be here for a drink or two and some standard pub eats. What have I been missing? 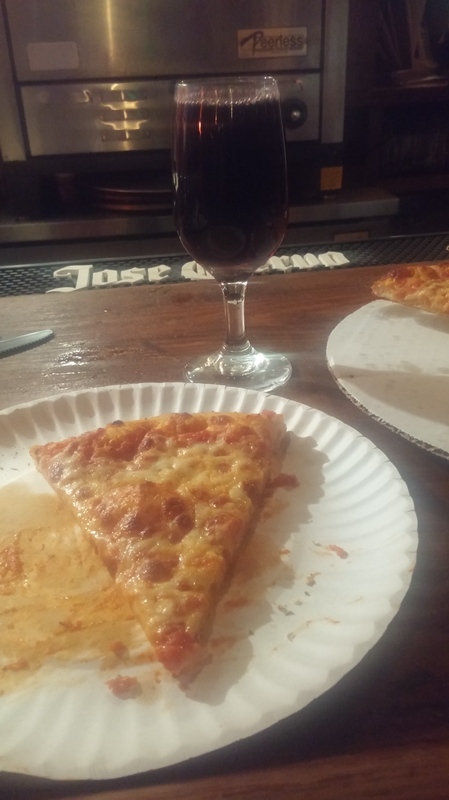 Now many folks have pointed out that it’s great drunk pizza. Well you could say that about most pizza couldn’t you? I’ve had it a couple of times after a few libations myself. I’m here to say that it’s good pizza period. There isn’t anything overly spectacular or glamorous about their pies. It’s just damn good pizza. And I think that’s what they intend. I will say that it’s much better than quite a few of these artisanal joints that charge an arm and leg just to grab a table. I’ll take this over those an time. This is a pictures show over several visits. 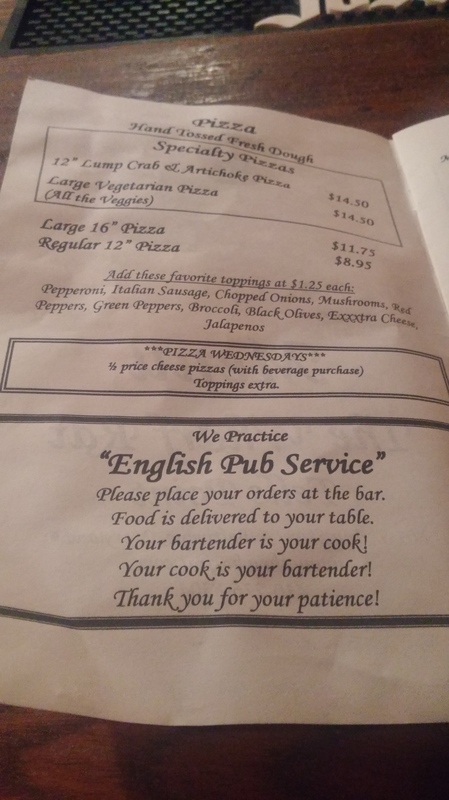 I love that the bartender is also the cook. It even says it on the menu! How awesome is that! So you get to see everything. 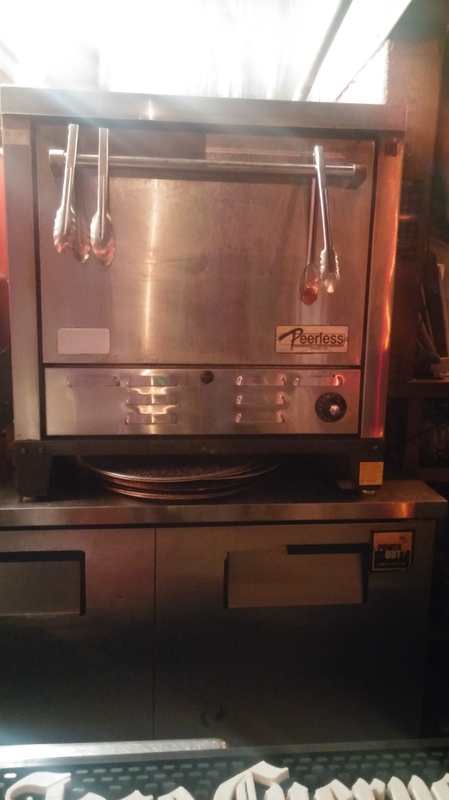 They prepare the dough, put on the sauce, the cheese, and heat it in the oven. I love how the kitchen is right there too. This is the pub experience my friends. And the staff over time has always been so approachable. I’ve never had an issue over anything, except other than myself being a tad under the influence. I was there on a recent Wednesday and didn’t even realize that personal pies are half off with the purchase of a cold on. I felt like it was my lucky day. The air seemed fresher, people seemed nicer, and I felt like I could change the world. Well maybe not that last part just yet. But their cheese is just a fun pizza. No thrills, no gimmicks, no shenanigans. One of the major stand-outs of their pizza is how crunch their crust it. It’s part of the reason I go and will keep coming back. I don’t know if it’s the magic from the dough, the way it’s rolled, or their oven, but I so look forward to that crispness. It feels so good with each bite. I take my time with it. 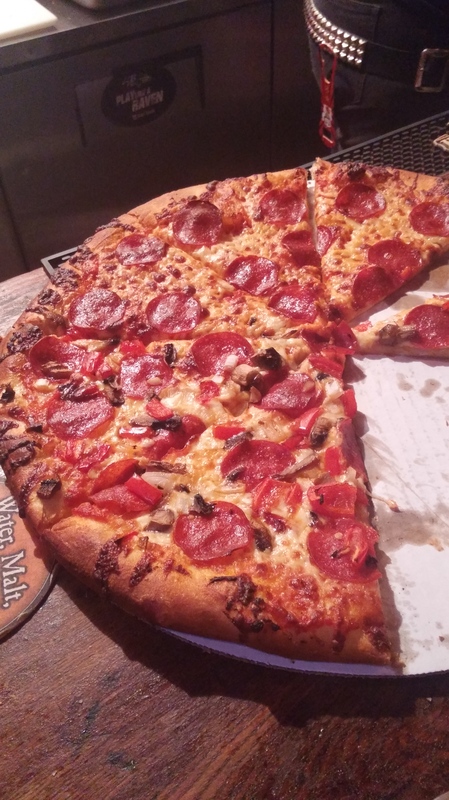 I joined a group late to share a half-pepperoni and half mushroom pie with pals. The photos will show a bit more of an impromptu experience. 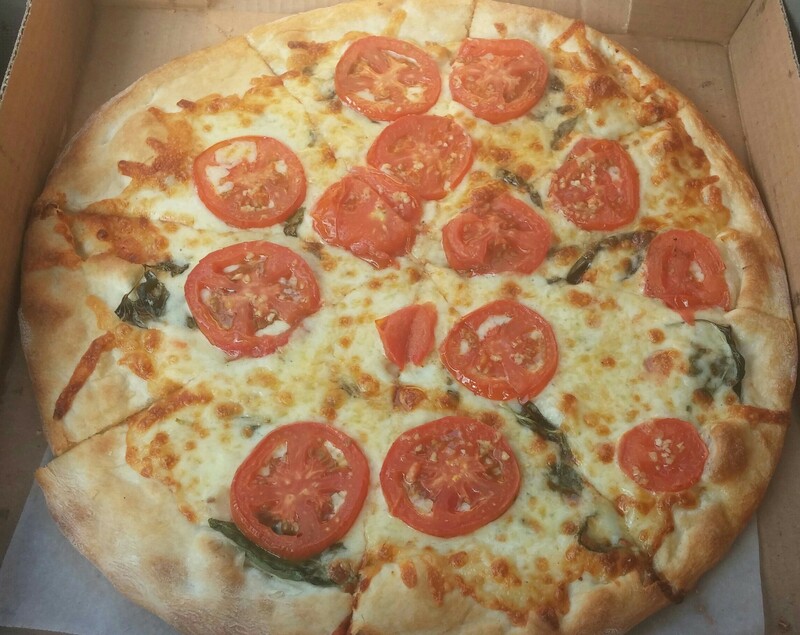 The toppings are always fresh too. And the mushroom bits were very tasty. That’s one of my favorite items on a pie and this pub only further enhances that. I was going to leave it at that but very recently I grabbed one of their signature pieces. Here is their Lump Crab and Artichoke pie! I got it to go but this was too good to not write about. You’ll notice it’s thinner than the other pizzas. It was prepared differently. The crab meat is the sauce and it was delicious. 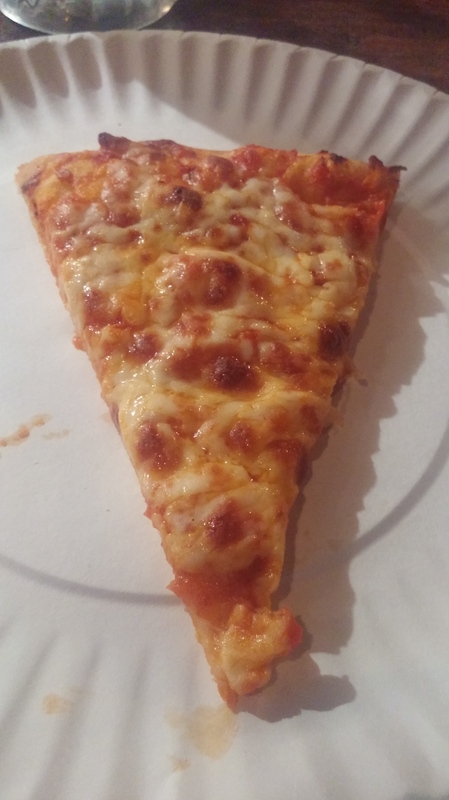 The slices were thin and for this instance it worked perfectly. 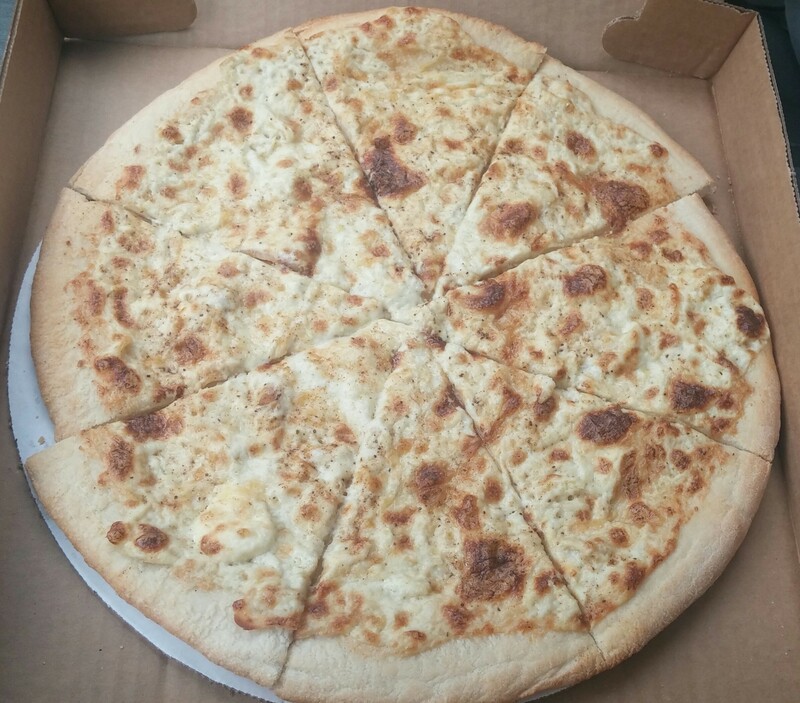 It was like eating a crab dip pizza on a very thin crust. Even though the crunchy dough experience was not as prevalent, I found it just as pleasurable to eat. One thing I feel good about is I like this bar even more now. Just me writing about this experience has made me appreciate it that much more. There’s been times I drive by the Ann Street spot and take it for granted. For many folks driving into the neighborhood it’s the first bar they see. I’ll make more of an effort to walk in more and not just park myself in the art of all the action. The fact that it’s just off the beaten path adds to their charm. I’ll see ya there! More Fells Fun is coming. 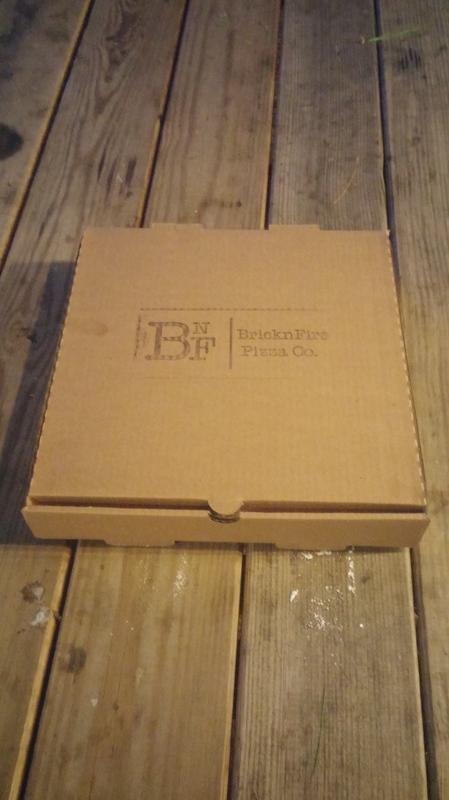 I had heard so much about BrickNFire Pizza out of Catonsville, MD, that I knew I was destined to try it. How or where I would have my first encounter would be purely unplanned. As luck would have it, I was enjoying myself at a wine festival last Friday, and I was happy to see they were serving up their pies as part of the event. In talking to people in the past, the great majority of them have sung the praises of their pizza. They’ve said how great the crust tastes. And that the overall flavor and presentation is distinct. Their toppings are homegrown which is always a plus. And they make their own sauce. Everything sounds amazing here. 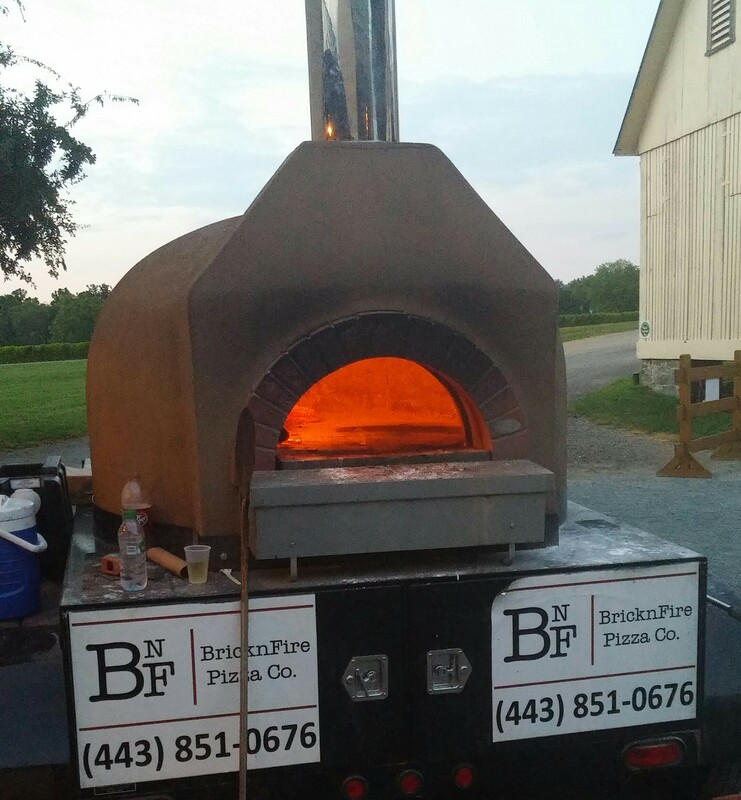 And in just the one year they’ve been operating, they have made a wonderful impression on a lot of pizza lovers. Sounds like a recipe for success. However, to my surprise, I did not have the best of experiences. I can take what people tell me and use the information as a basis to form my own opinion. And maybe understand where they’re coming from. But in this instance something fell flat. I do say this with a disclaimer, I got my pizza in the latter stages of the evening. I ordered the Megan’s, which looked really good on paper. I don’t think I’ve ever had squash on a pie, so I was really excited to try it. 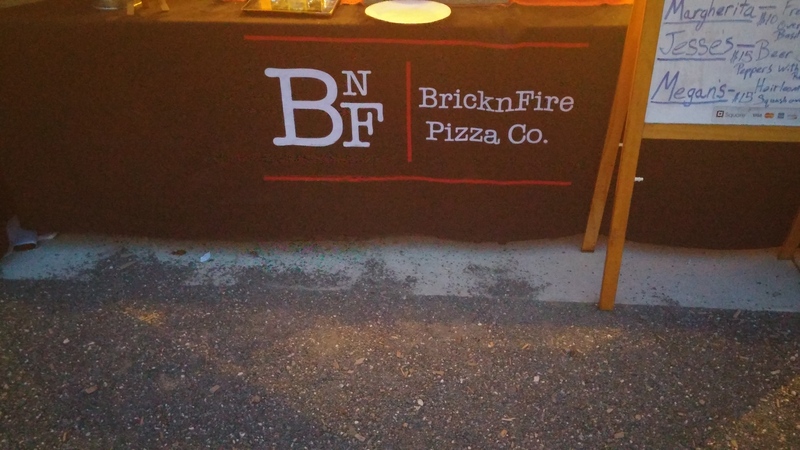 To my disappointment, they were out of their Heirloom Tomatoes, as they told me this was the fastest selling pizza of the night. I can understand that and willing to try something else. The staff there suggested green peppers in place of that and I was ok with that. It just did not come together well. I could see the tomatoes were a huge part of this one, and the flavor was missing. But, there were a couple of other things wrong. I didn’t taste much in the way of basil on half the pie. The garlic oil and mozzarella seemed non-existent. It just tasted very plain to me. However, the vegetables were great. 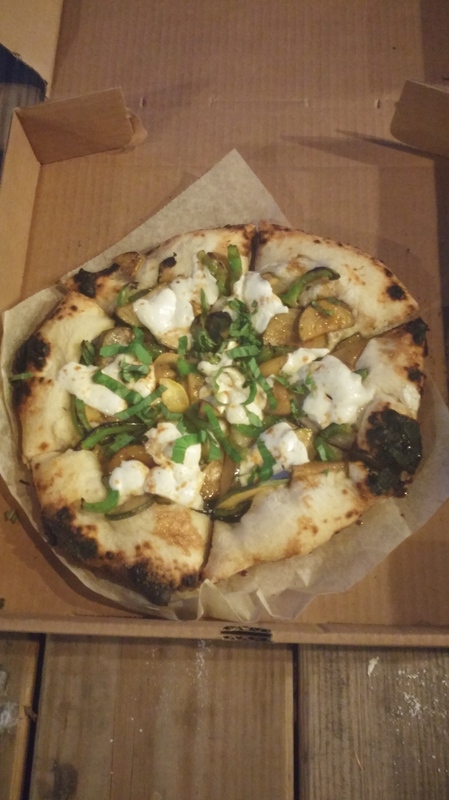 I really liked the squash and the peppers were fresh but they did not fit in with this pizza at all. And I will not give them demerit points for offering a new topping to replace the tomatoes. But I will question the $15 for this pie. I understand this being market price but I don’t see the justification in the cost, especially for not having all the ingredients as advertised. The dough was tasty and the burnt parts really added something. A friend who was with me liked how certain parts were more charred than others, but agreed with me that the pie had been compromised. It was a serviceable yet mediocre creation. I think the soul was missing from here. And that’s just as important as anything else. I like Neapolitan-style pizza so this made me sad. I know it was towards the end of the evening, but this was disappointing. They also took a while to making my order by a few minutes longer than promised. I understand they were backed up, but I feel as if I hadn’t come back to check on my food, they may have forgotten about me. Heating it up at this temperature only takes a few minutes. With all this being said, I will definitely try one of their za’s again. I have mainly heard positive things about their pies, so I was a bit surprised at my troubling experience. 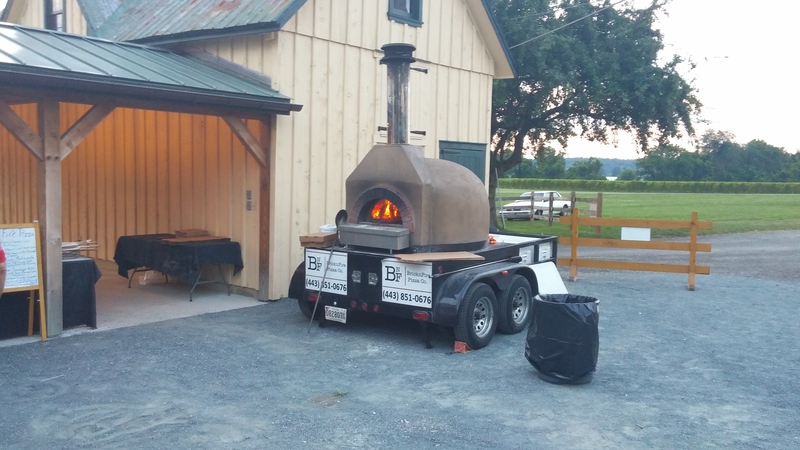 Their wood-fired oven looks impressive and I have posted pictures of the massive work of art. I’m not big on first impressions, and I expect my next pie to be nothing short of stellar. 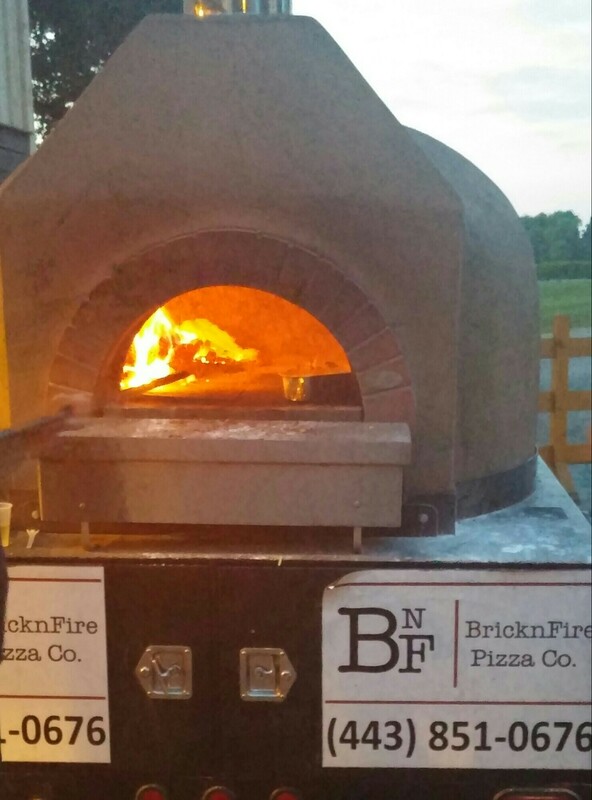 For more on the wine festival I attended, where BricknFire was click here. 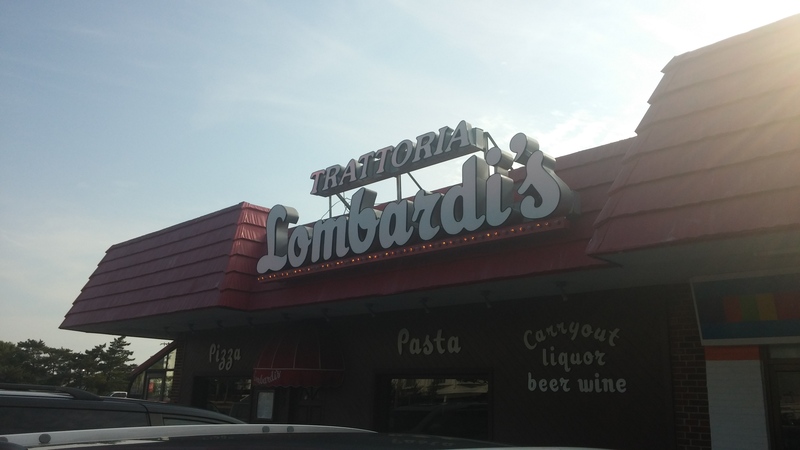 Whether it’s the locals in town or folks on vacation, people have sung the praises of Trattoria Lombardi’s (or just Lombardi’s for short) in Ocean City, MD. 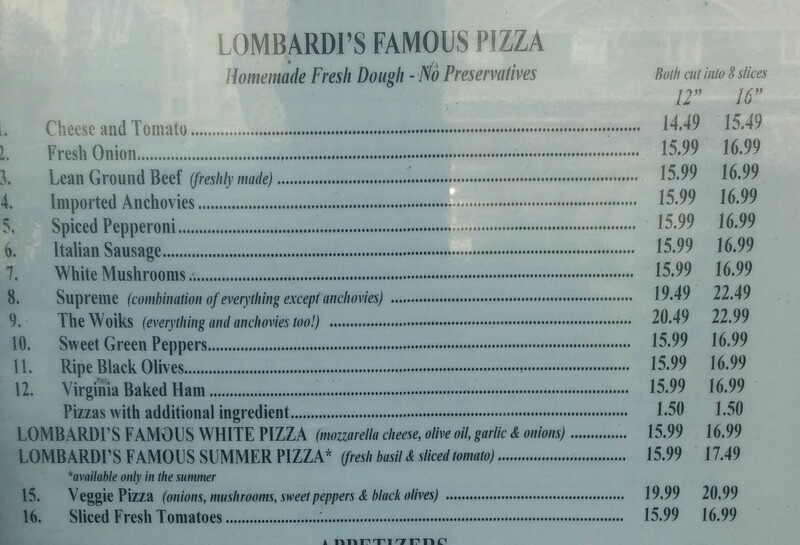 When I mentioned to my fellow pizza pals that I wanted to focus on pizzerias by the Maryland and Delaware Beaches, Lombardi’s was the top request and suggestion. I am grateful to only live a couple of hours from the Eastern Shore. And I am grateful to have made a visit to this famous restaurant during 4th of July weekend. And the fact that it was during the holidays will be taken into consideration. The interior is very authentic. It’s an older restaurant and I like it that way. There was really no chance to take photos inside, since it was such a sea of humanity. And what I would try to capture would be lost in the shuffle. The place was packed and the lines to get a table or even to order food to go were growing by the minute. There was such a frenzy and I wouldn’t expect anything less during such a hectic time of year. I ordered three pies to go, for my friends and I to enjoy. While scanning the menu I was pleased to see a special Summer Pizza. Of course I had to satisfy my curiosity. Unfortunately this was my least favorite. The tomatoes and basil on the white pie really didn’t click for me. It wasn’t bad. It just didn’t come together how I had hoped. The dough on all three were cooked very well. It was the right about of crispness and softness at the same time. The visuals are a delight. 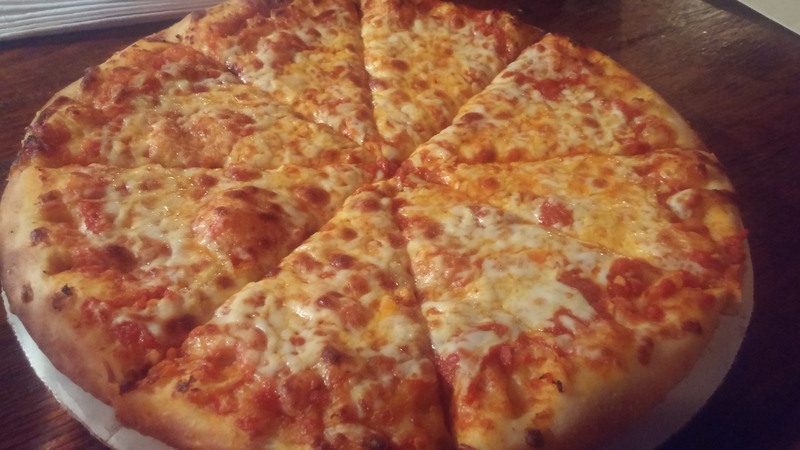 I love how the cheese looked so magnificent melted into the crust. But for this one, maybe it was a rush job. The tomatoes don’t need to be cooked all the way but it felt like they were thrown on at the last-minute. 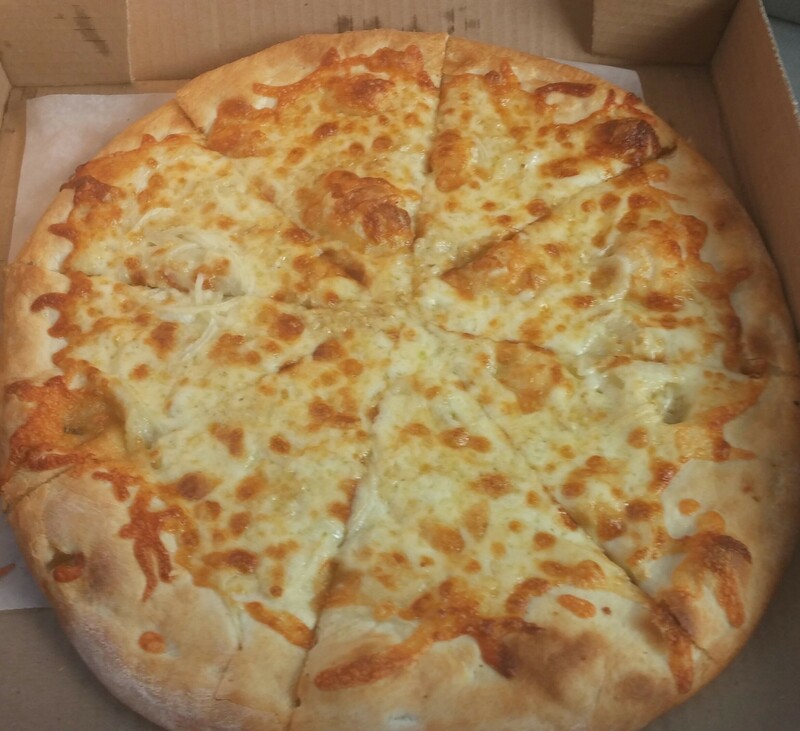 Next, we have the White Pizza. I didn’t realize until I was eating it that it had onions. I thought it was a mistake or a few onions had spilled over from another order by mistake. It wasn’t until I looked at the menu that I saw this was their special version. And I really liked this one. I found this very tasty and love how the onion is a part of this pie. If you look close you may be able to see them in this picture. This was my favorite of the three. And finally, it’s the Cheese. 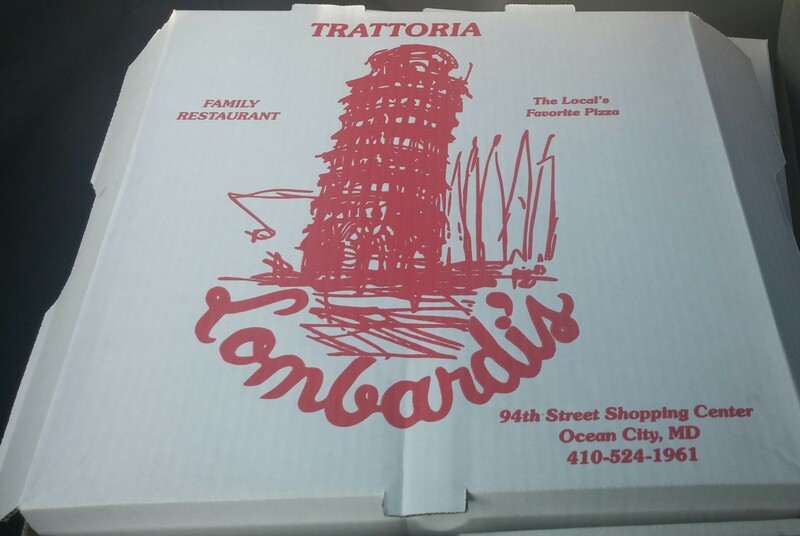 So many people have told me this is one of their favorite pizzas at the beach or anywhere in Maryland for that matter. So I had high expectations. They did not reach them. I thought it was good but it didn’t turn out as great as I hoped. I’m not sure what I was hoping for but this was a notch or two below that. Nevertheless, my buds and I ate this pizza up over the next couple of days because it was very good. And it tasted great reheated. But I don’t think it’s quite the blow away pizza others have touted. But as I previously stated, I understand this tasting fell on a holiday weekend, so I will definitely give it another go. And I would eat here again anyways, either in-house or carry-out. I found this to be a very good but not quite the amazing feast I felt would happen. In a way I blame myself for such high expectations. But I can’t way to go back on another day and have those same expectations. I believe the hype! 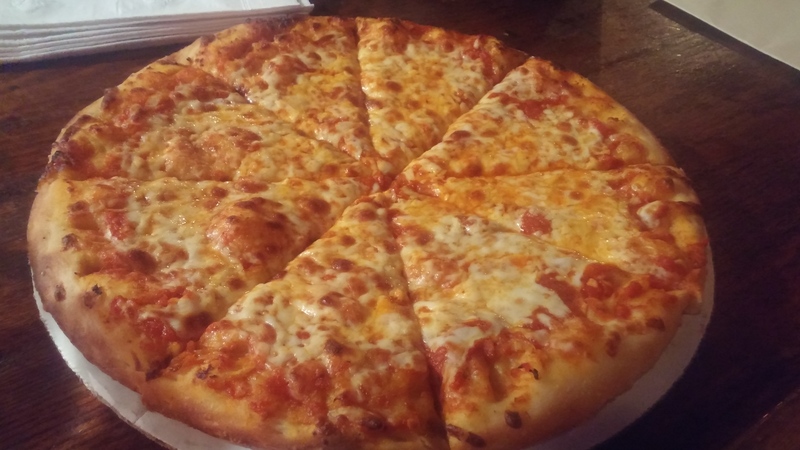 If you’d like to read my previous resort themed pizza posts, click here and here. Just in time for Artscape, I wanted to get around to writing about Two Boots in the Mt. Royal section of Baltimore. For those outside of the area, if you aren’t familiar with this festival, its massive. Major streets are shutdown and it’s a sea of humanity. It’s really quite the visual. 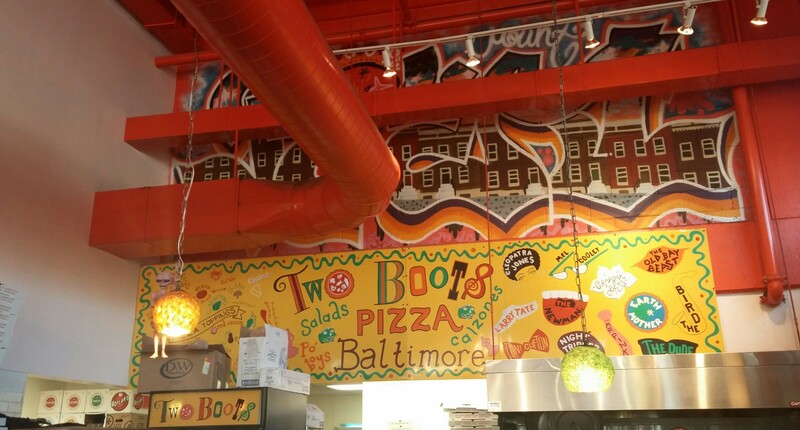 This pizza establishment, based out of New York, is entrenched in the heart of MICA and the University of Baltimore. Penn Station is nearby as well. Because of the diversity of folks, from locals, students, business travelers, tourists, and passersby, you get a very unique energy when you go inside. I would like to think that’s usually a positive. But, the last few times I’ve gone it’s been a weird vibration of sort. It could be what I’m seeing or it could be all the moving parts around me. I’d like to think it’s a little of both. It has been uneasy at times. My most recent visits, have led to 15 minute plus waits for just a couple of slices to be heated up. And it’s with little to any line in front of me, or people waiting for their orders. However, I have never been the biggest fan of their food. I’ve only had pizza but it as never blown me away. And many times when I wanted a slice, because of the toppings, it would be gone. That’s likely a combination of their popularity and so many people coming in and out getting whatever slice may be available. And that happened to me on the eve of this event, which starts today. The two I really wanted to get today were unavailable, and there was a 15-20+ minute wait time on the next pie to come out, which is understandable, just frustrating. 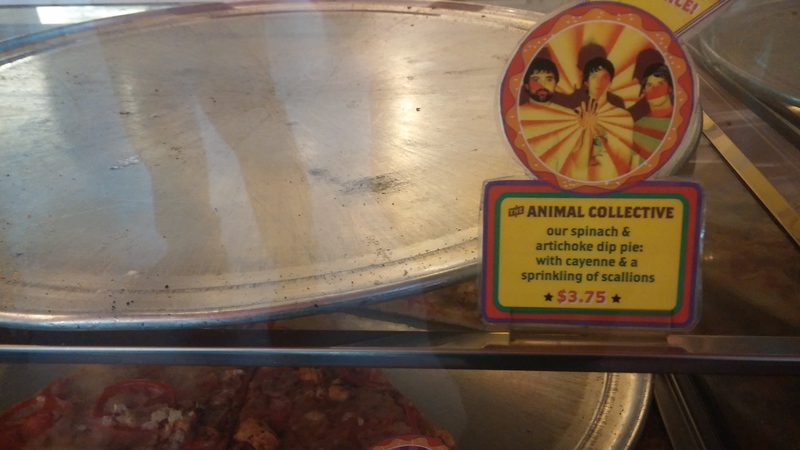 The Animal Collective, which is a spinach and artichoke pie, had been decimated way before I got there, from what I was told. I would like to give that a shot sometime. 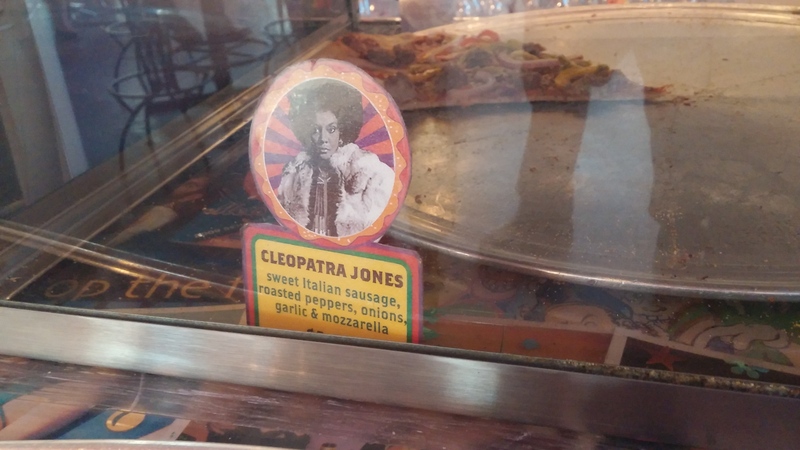 And the last slice of Cleopatra Jones was taken by the person directly in front of me. It was a bit disheartening but the early or last-minute bird gets the worm. So with what was available, I ordered the Mr. Pink and because they were low on slices, a regular cheese. You can always judge a place on their cheese. The cheese nor the Mr. Pink I found enjoyable. I could barely taste any cheese and I am not a fan of their sauce. For the latter, the creole chicken didn’t taste particularly good. It wasn’t fresh. I was in New Orleans for the time first time recently and tasted some wonderful chicken, along with other meats. This wasn’t it. I’m not all of a sudden an expert on southern cooking. I just want it to delicious and feel good eating in the process. 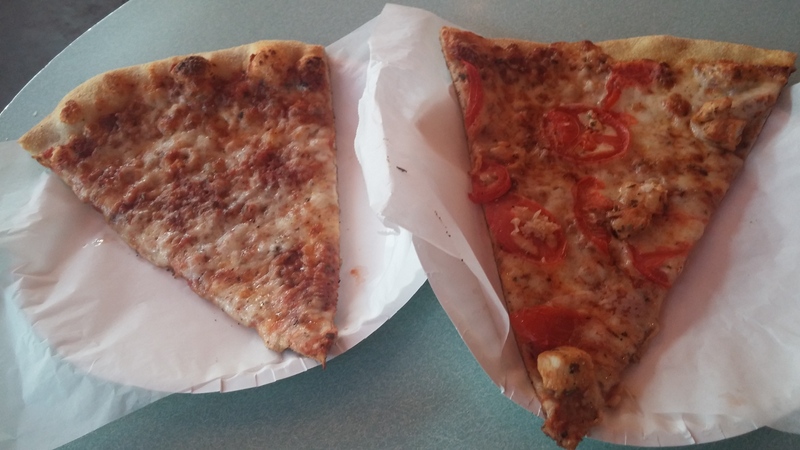 These were both very mediocre slices. And the cornmeal crust is an interesting topic of discussion. Some of my friends love it more than regular dough. I find it very coarse and rough. It feels funny on my tongue and when chewing it. It’s not likely to be an acquired taste. Good crust is good crust. This isn’t it. I wasn’t able to finish either slice and found myself pining for something else. And the wait for my two slices was again, around 15 minutes. With this major festival happening, the wait for your slices and pies will likely be much longer. And a few of my peers love it, as might you. 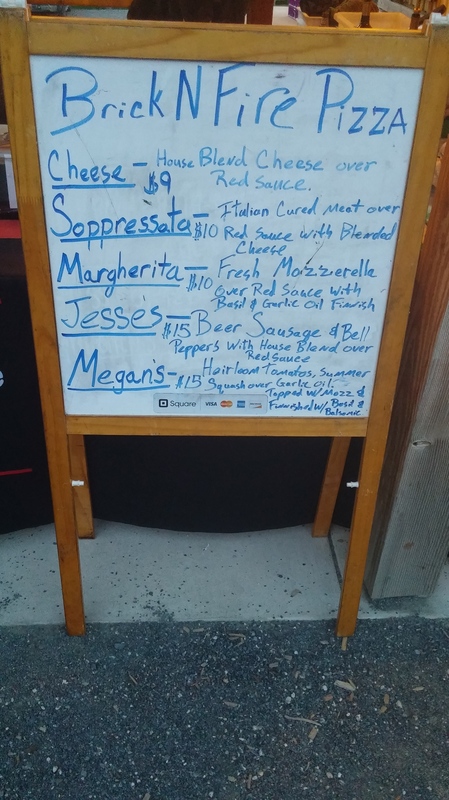 I wanted to post about this because if you’re attending the festa, you may want something other than food truck or outdoor vendor to snack on. 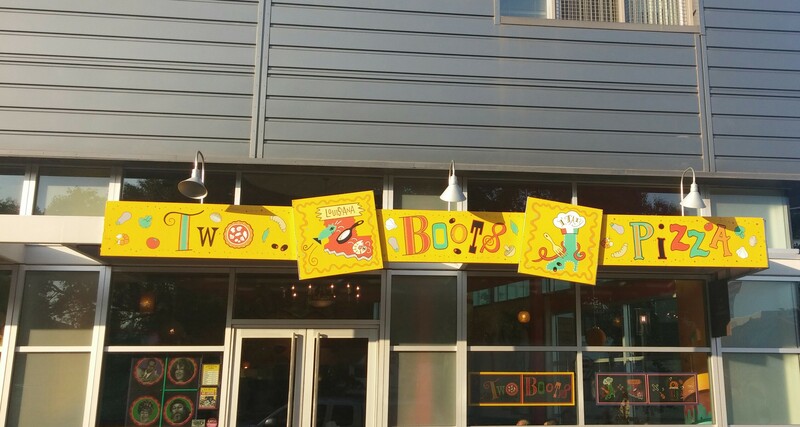 Two Boots, with its wonderful storefront signage and charming names for their za’s will be easy to spot. And I wish them a massively successful weekend! 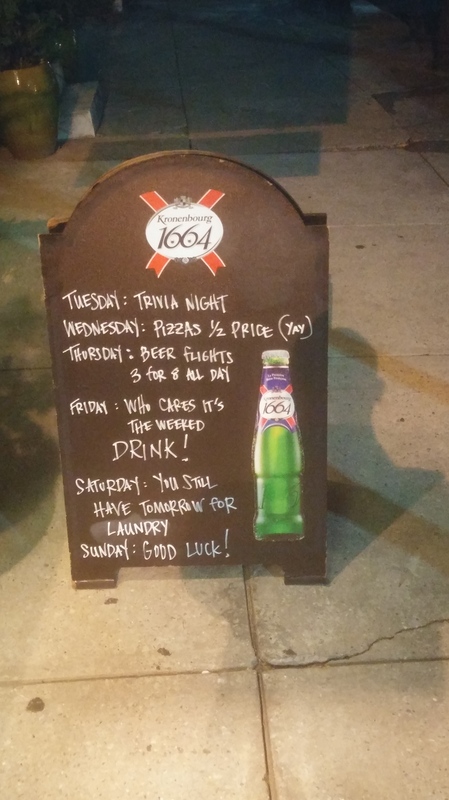 It’s going to be a great for few days for Baltimore and the local businesses nearby. The positives that will come from this will be infinite. And because they have so many varieties, I will gladly try them again. And I understand how busy they can be, so that may lend itself to rushed cooking jobs. The staff has always been friendly and show a great deal of patience during busy times. Most important of all, they have a large community presence and that always feels good to read about. If you head down, see you at Artscape. Enjoy! Ocean City, MD has always brought me found memories, from when I was a kid. A lot has changed but a lot has remained the same. There’s a lot more to do as an adult, in terms of bars, clubs, and restaurants. But, this resort town prides itself on being a family destination, first and foremost. 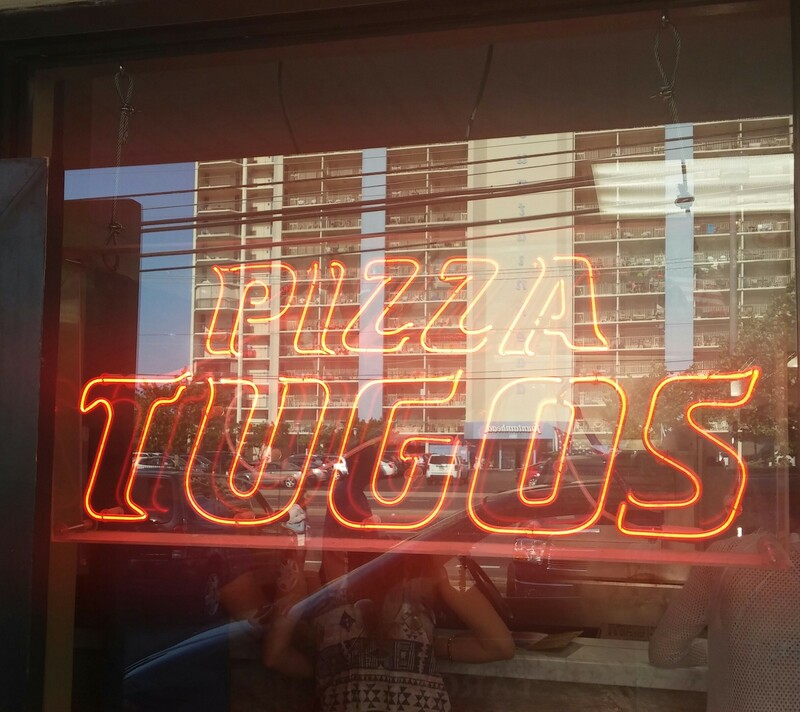 I remember eating Pizzas Tugos when I was a kid and thinking it was the greatest pizza on earth. Actually every pizzeria I ate at felt like the greatest thing in the world! Either my taste buds have expanded or I just grew up. 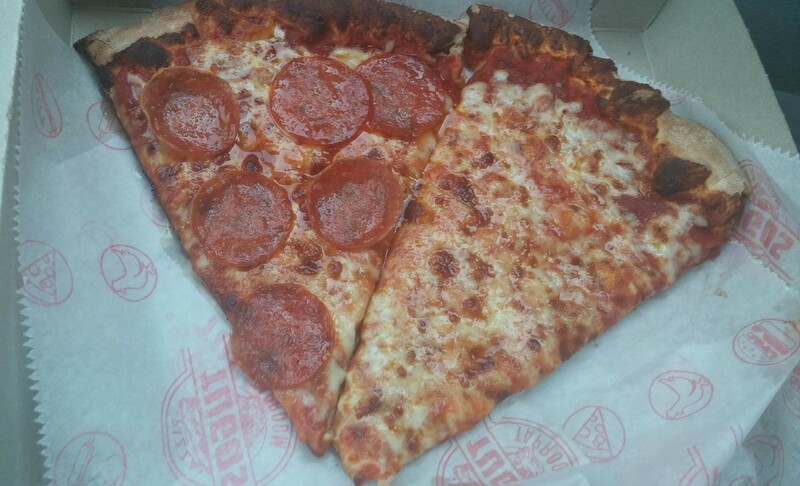 Because these two slices I got were anything but the greatest. How great and greasy does that appear? Well it may look appealing to the late night delivery and pick-up crowd, but that still doesn’t make it any better. I understand this is a small sample size, but it was still disappointing. It was way too loaded with grease and fat. Now or a night after the bars, that might be just fine. But I can only imagine what you’d be feeling the next morning. It was also very salty. I do like how there was loads of cheese bleeding into the to go (tugo? hehe) box. But the cheese was a big mound of salt and other problems. The sauce tasted a bit funny too. It just didn’t go with the cheese or the crust. And the latter was a bit soggy. I tried to eat what I could, but I had to give up. Some of the other problems included the service. There was no line in front of me, and I waited a good 15 minutes for my order. You would think with all that time passing, that my pizza would be either heated up just right or a bit lukewarm, or maybe a little of both. No, this was scolding hot and not in a good way. My tongue burned but fortunately I survived and didn’t need a fire extinguisher to save me. 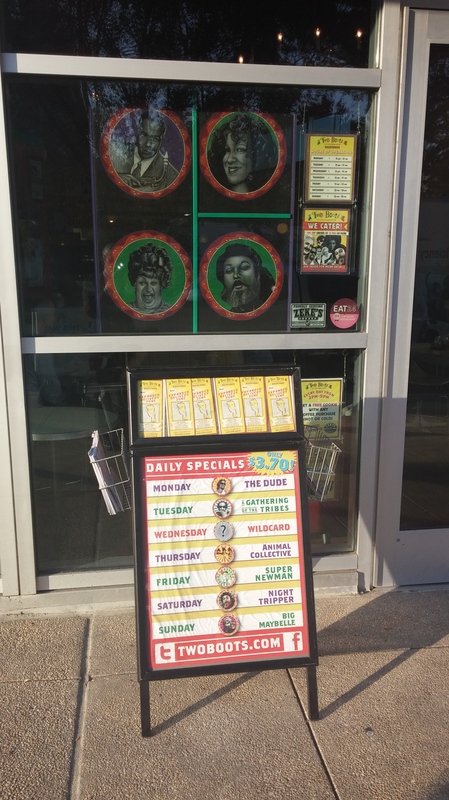 In keeping up with trying to find positives, I do like that they have their own design paper for carry out, which you can see in the first picture above. Other than that I don’t know. Well, the pepperoni was ok. I picked those off and ate those on its own. Now when many of us are at the beach, or away on vacation, our goal is not necessarily to look for amazing, knock your socks off pizza. But it should at least taste good. This wasn’t the worst but I found it mediocre and boring. I don’t see the point in coming back to visit anytime soon. This shouldn’t sway you from not wanting to try them out. You may love it. I know a few who do. Here’s their menu. Summer is in full swing, so more OC and Eastern Shore reviews will be forthcoming. For a prior review from Memorial Day Weekend, click here. 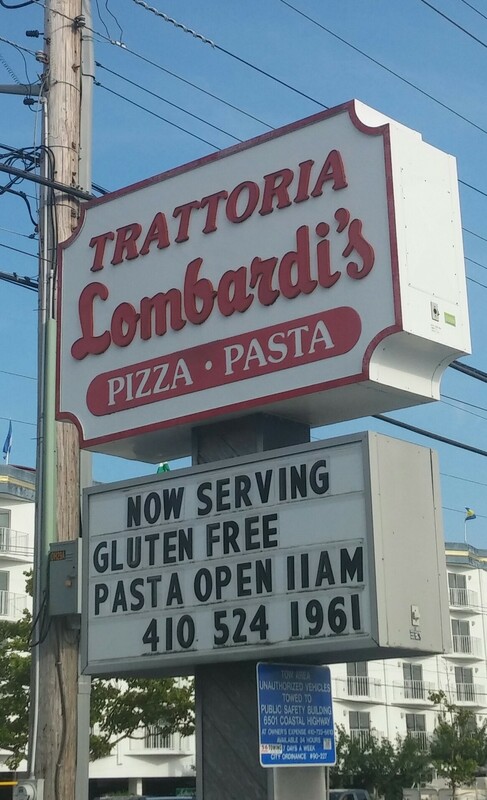 Now that we’re officially into Summer, I am grateful and happy to incorporate pizzerias near the Maryland and Delaware beaches. For part of the Memorial Day weekend, I took a drive to the famous (or infamous depending on how you look at it) town of Dewey Beach. It’s known for it’s bars, clubs, and other various social activities. 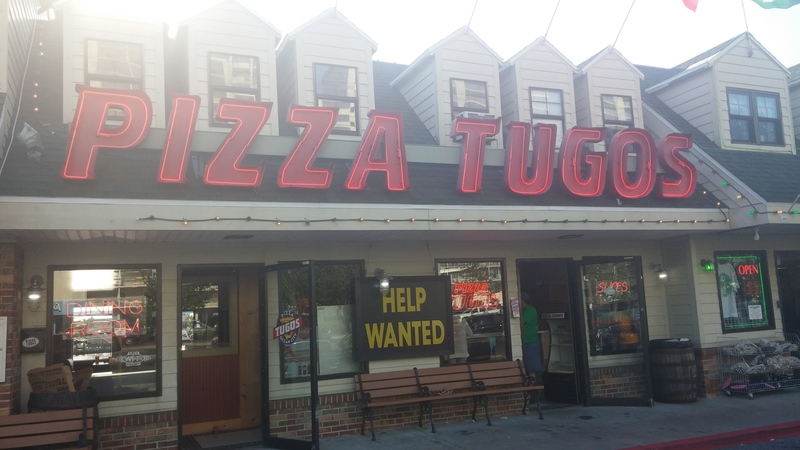 So how is their pizza? Well for my first visit, the results are not good. 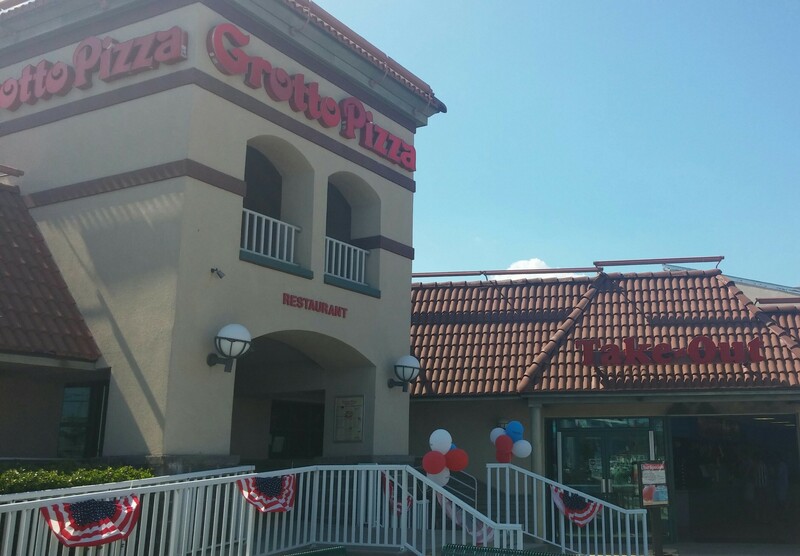 One of the most visually noticeable establishments in the resort town is Grotto Pizza. So this is where our inaugural Summer themed posts will commence. I’ve been here several times before, so I knew what I was getting myself into. I was preparing for the worst, as previous visits have made me wonder why I keep coming back. Well it’s because it’s convenient and it’s right there. And the outside decor and entrance is very welcoming and approachable. I wish I could say the same about the clientele. I know it was Memorial Day Weekend. So it was going to be busier than usual and the staff might be overwhelmed. When I walked in there was a decent line of a half dozen people, so I didn’t expect to wait too long. It was about the wait I expected. If it meant the pizza would taste better, I’d be happy to wait longer. But not on this day. I ordered a cheese and pepperoni slice each and both felt soulless. I know Grotto has been known to add a lot of sauce on their pies, which is ok. It’s a little sweeter than sauce I’m used to. It just didn’t come together. I do like that there was a decent amount of pepperoni thrown on that particular slice. It just didn’t taste like a good piece of pepperoni. I picked a couple off and ate them on my own and it didn’t taste fresh. The crust and dough felt soggy, boring, and gross. Unfortunately, I barely finished a third of either of my slices. They were that bad. And I don’t like wasting food. But I didn’t feel good eating this pizza. 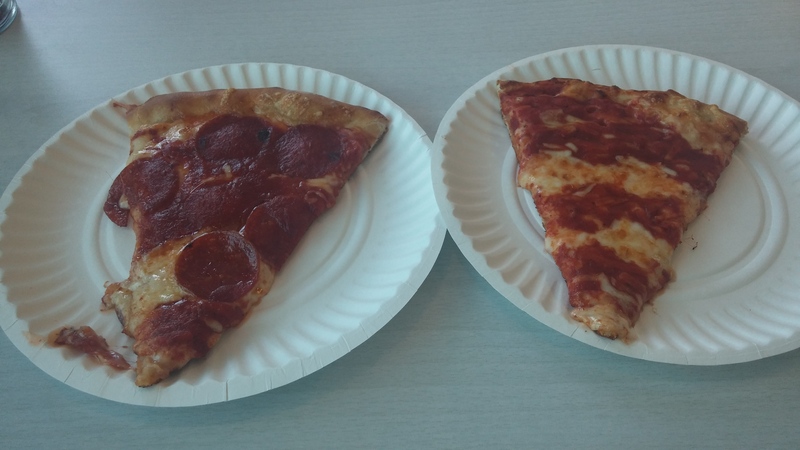 I paid nearly $8.00 total for both slices. I don’t see any justification for charging that amount. When I was a kid I would eat at the many various locations near our great beaches. And I seemed to recall, it tasted much better back then. Or maybe I’ve grown up and my tastes have expanded. I didn’t go into this looking to trash this establishment or other pizza places on the Eastern Shore. I went into this with an open mind knowing the time of year, the patrons, and the business of the weekend. Nor was I expecting high end, brick oven, or artisanal pizza. What I do expect is that the pizza tastes good. That’s not asking much. And this didn’t even come close. We all a whole Summer ahead of us. And more beach pizza recaps will be coming. I hope you all had a great holiday and enjoy your weekend! I wanted to wish congratulations to the Class of 2015. Many Universities are having ceremonies this week and that includes the Naval Academy. I actually helped with the set up and break down of the stage and seating, for their ceremony one year ago. 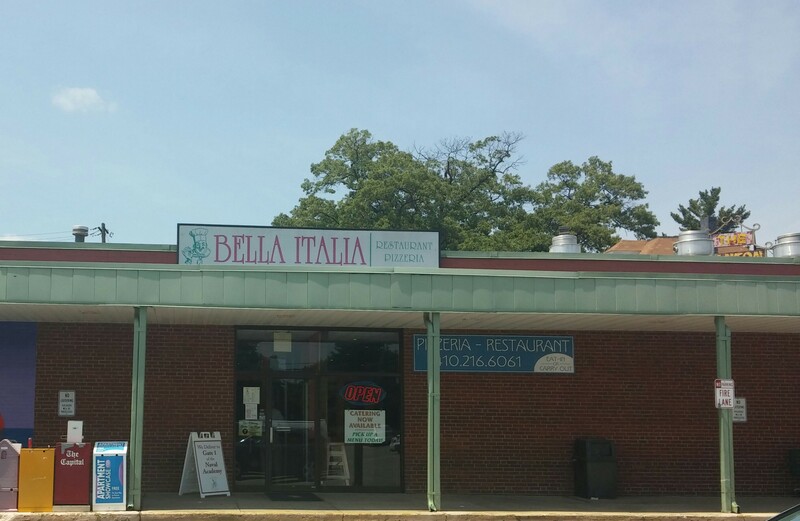 In honor of graduation day, Memorial Day, and my sentimentality for our capital, I will be reviewing Bella Italia. Which is walking distance from campus. As you can see, there isn’t much to the website. I basically posted all that can be seen. I’m not sure if it’s still a work in progress or it’s going to be left alone. But most importantly, how is the pizza? This is a recap over two visits in the past month. Which happen to be my first and second visits ever respectively. 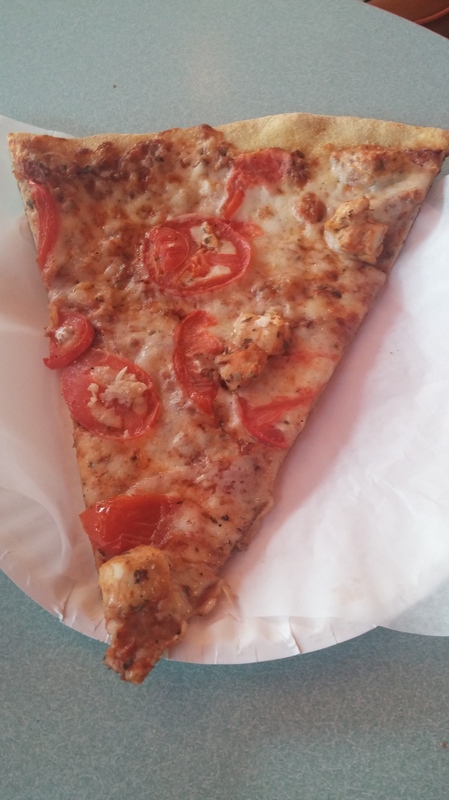 Two slices and two visits! Hehe. Let’s get to it. For round one, I got my order to go. 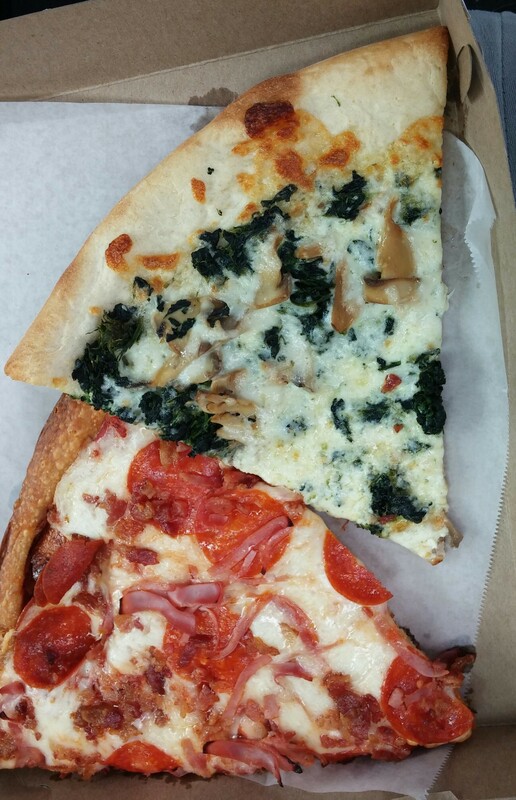 My first slice was a White with spinach and mushroom. There really wasn’t much to it. It was a decent slice. The vegetables tasted fresh. The white didn’t taste as good as other ones I’ve had. The dough and crust were good. It just didn’t wow me. It was decent at best. And number two was the Meat Lovers deep-dish style pizza. This was fantastic. It blew up me though. I’m glad I tried this, as I don’t always see the Chicago-style slices available to patrons. I took my time eating this. 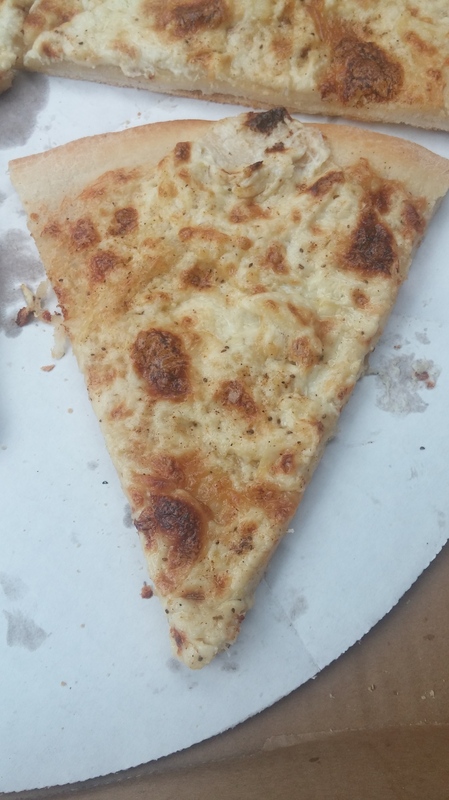 It was the perfect amount of crust. I would be lying if I said I finished this right away. It tasted just as good as a leftover meal the next day. The meat and cheese really blended together into the pie. And you can see it’s loaded with pepperoni, ham, sausage, and bacon. And they didn’t skim on the toppings! And for my second visit, I dined in. The interior is very quaint and doesn’t feel contemporary. It does give a hole in the wall vibe and I can appreciate that. The staff was very friendly both times. 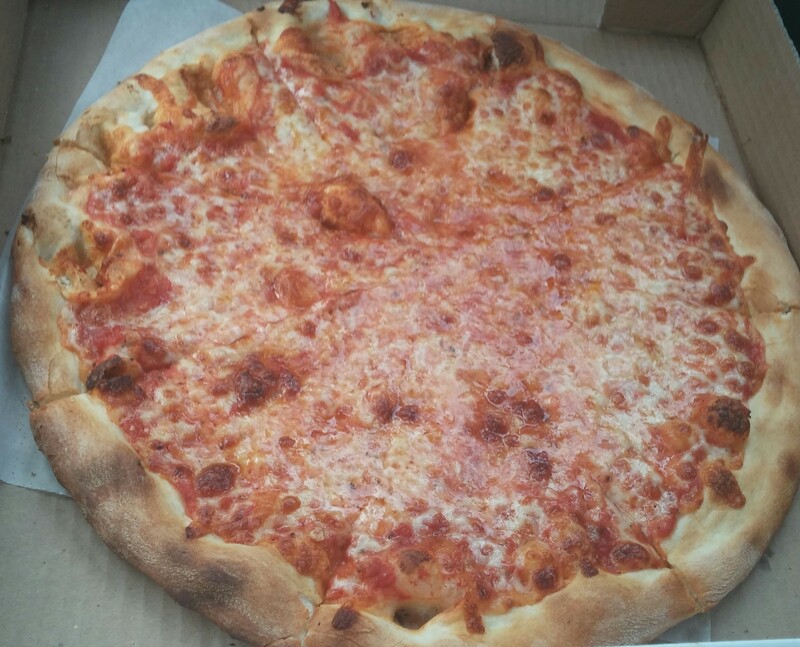 For my first slice, I ordered the cheese. This wasn’t good at all. It might have been in the oven too long and tasted too crunchy for my liking. There was a little burnt taste in my mouth as well. This wasn’t the worst cheese I’ve had. But this was disappointing. I wanted to end my post on a high note and I will do just that. 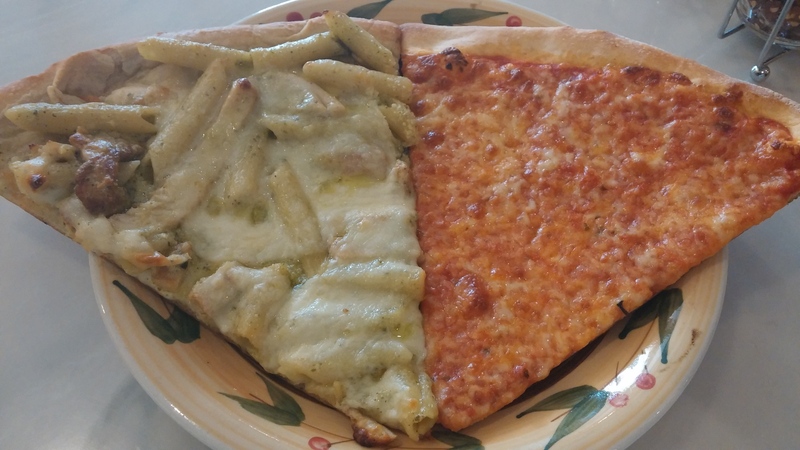 The other purchase shown above is the white with pesto, grilled chicken, and penne! This was wonderful. The chicken and pasta tasted fresh, and pesto is one of the marvels of this universe. And I always smile when I see toppings buried under the cheese. It’s similar to finding hidden treasure! The simple things and metaphors is what life’s all about. 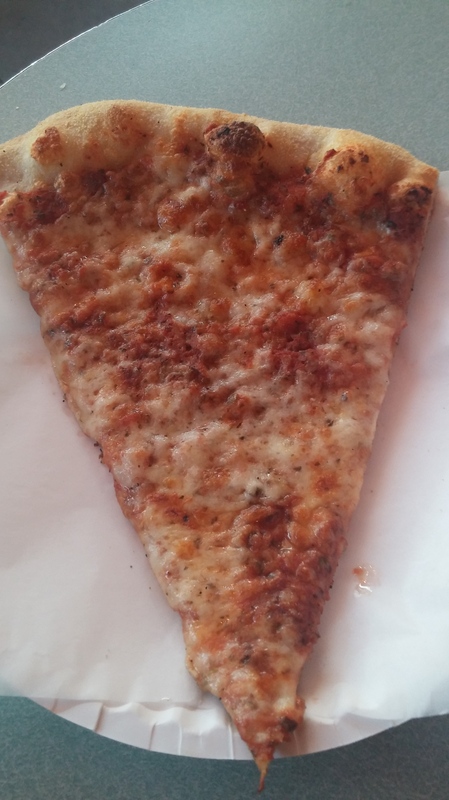 This is one of the better slices I’ve had since doing this blog. I was happy I ordered this and went out of my comfort zone to try something a little different and unique. So there’s some great slices and some not so up to par, in my humble opinion. I’m in the area a lot. And I’ll be definitely giving this spot a look again. 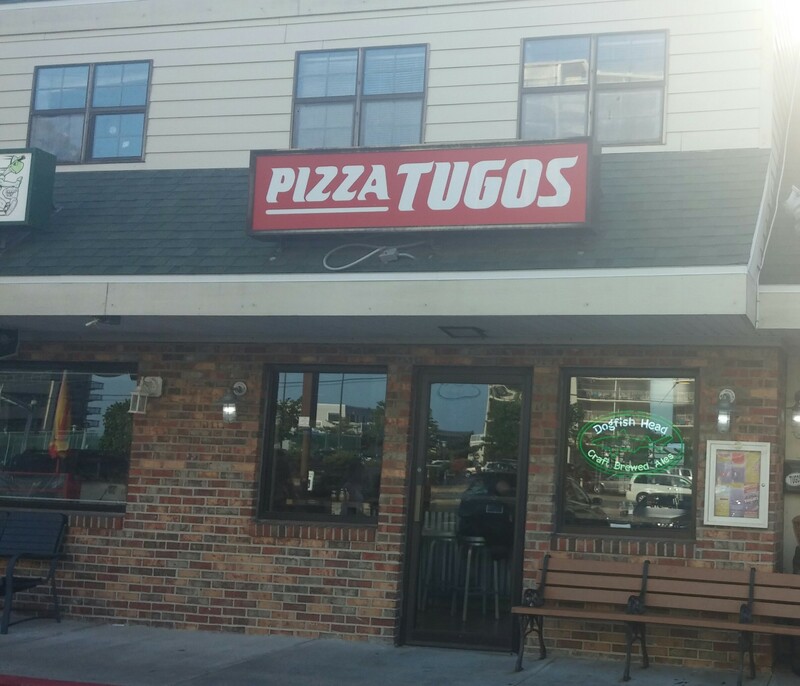 For a recap of a previous Naptown pizza place, click here. I wish you all a Happy Memorial Day Weekend. Stay happy, healthy, and have fun!